I am so excited today to welcome author Jeanne Bannon to my blog! Jeanne has been a part of the publishing industry for over twenty years, working first as a freelance journalist, then as an in-house editor for LexisNexis Canada. She currently works as a freelance editor and writer and is represented by the Serendipity Literary Agency. Her debut novel, Invisible, a young adult paranormal romance, has been optioned for film. Invisible is an Amazon bestseller both domestically and internationally. Another of her novels, Nowhere to Run, tells the story of Lily Valier, a woman of substance and beauty, and her dilemma when she falls in love with a man whose mission it is to bring her down. 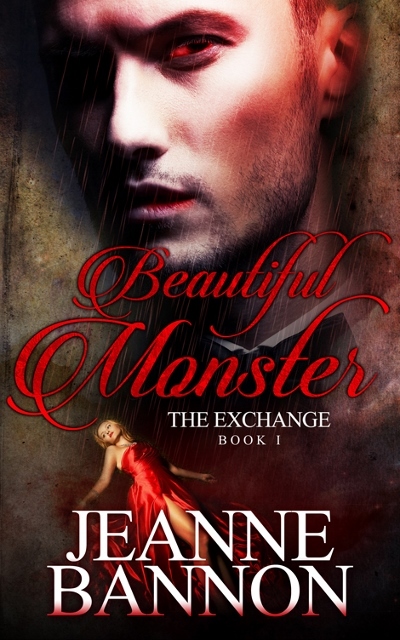 Jeanne is here to introduce us to her new novel Beautiful Monster. Lev Baronovsky, a soulless creature of the night, has a problem. Carly, the love of his life has just died in an accident and in three days will pass to the other side. Without a soul, he cannot cross over with her and the thought of spending eternity without his beloved is unbearable. Is seventy-two hours enough time to find a way? With the help of his brother, Alexei, they must face the vilest creature of all, Boris, an ancient one with selfish motivations of his own. Lev was able to glean whatever information he needed in an instant. But with the simple facts of Carly’s accident came the realization his brother was happy for the turmoil. A hint of a smile had curled Alexei’s full lips, and his eyes were bright. Lev was not surprised. He pulled his thoughts from Alexei and looked down at his beloved’s hand in his. Thepallor of it matched his own. He listened to the slow rush of blood through her veins, willing it to grow stronger. Moving close, he whispered, “I can save you.” He brought her dainty wrist to his lips. She smelled like death already—like the musk of freshly turned earth. It was now or never. His fangs pricked at her delicate skin, drawing a bead of crimson. It tasted of iron and copper and of her. Carly’s very essence was in that droplet. Purchase your copy of Beautiful Monster on Amazon today! Read the book and loved it! Jeanne is a very talented writer. Love the title! Thanks for the fabulous snippet. Wonderful! Jeanne is more than a talented writer!